There's a new development, unprecedented so far -- having the Commission on Human Rights (CHR) -- to accuse and harass multinational firms engaged in oil, cement, coal and mining. 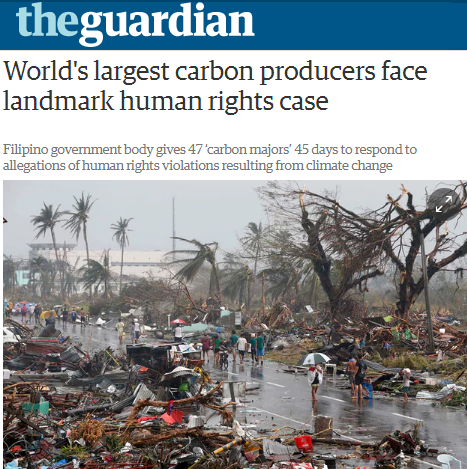 "In a potential landmark legal case, the Commission on Human Rights of the Philippines (CHR), a constitutional body with the power to investigate human rights violations, has sent 47 “carbon majors” including Shell, BP, Chevron, BHP Billiton and Anglo American, a 60-page document accusing them of breaching people’s fundamental rights to “life, food, water, sanitation, adequate housing, and to self determination”. I support the CHR and its Chairman Chito Gascon, a friend, in their fight against extra judicial killings (EJKs), hundreds of these cases so far nationwide since mid-May 2016 alone. Their time and resources can easily be depleted if they go person to person cases, dead or imprisoned. But I can not support the CHR in this new climate harassment. The first round of climate extortion is by governments of developing countries, demanding $100 B a year from governments of rich countries, under the various UN FCCC annual negotiations. So this is the 2nd round of extortion, NGOs and the Climate Change Commission (CCC) that prodded the CHR ultimately to result in demand for big money from big multinationals as "climate justice." So whether we have bad El Nino (drought, less rain/no rain, rise in global and Pacific Ocean's Nino regions temperature) those multinationals should give money. Or a bad La Nina (lots of rains, lots of flooding, decline in global temp.) those multinationals should still give money. Pera-pera na lahat. A similar situation would be Mr. X having less money and more money and people say that it is proof that he's poor, so government should send him more money and other subsidies. I remember that last January, Chito posted about the CCC-CHR meeting. So it was the CCC that influenced the CHR to launch this HR investigation. The hypothesis "more CO2 emission = more global warming/anthropogenic climate change" is a global and UN-hyped movement. Then later via other schemes, these firms should pay huge amount of money to the "climate victims" like the thousands who died in Tacloban City in November 2013 during typhoon Haiyan (local name "Yolanda"). In November 1912 or 101 years before Haiyan struck Tacloban, a huge storm also struck the same city and killed some 15k people. 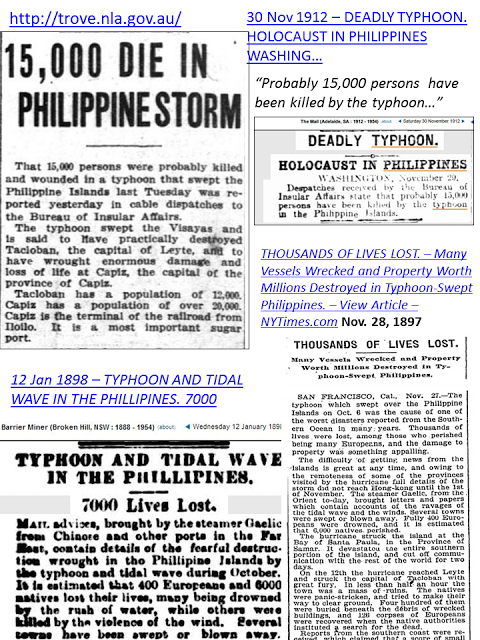 Haiyan killed more than 8,000 people out of some 98 M people in 2013, but that storm in 1912 killed 15,000 people out of only around 7.6 M Philippine population that time. Those big multinationals in oil, mining, cement, coal were responsible for that "man-made climate crime"? The CCC, WWF, other anti-fossil fuel environmentalists/NGOs/UN agencies have a great grand plan at climate extortion. They use their cars too often (not walking or cycling often), they frequently jetset to nice big beautiful cities abroad (not hitching with witches and manananggals who are fossil-fuel-free), they enjoy huge beautiful buildings and hotels made of cement and steel, they enjoy their electricity 24/7 (largely coming from coal power). Then turn around and demonize the oil, cement, coal and mining companies and demand huge money from these firms to compensate for their "climate crimes". Bright, very bright scheme. Chito replied that "the CHR, in the course of these proceedings, will not go to the extent of imposing monetary penalties... the outcome of the process will be a report on the matter." I thanked Chito and apologized for any misunderstanding but I am referring more to the CCC, not CHR, on the money issue. Because it is not in CHR nature to demand money from the accused firms (except the case of the Marcos' HR victims during Martial Law). But ultimately it will lead there via other channels, with the CCC leading the charge. 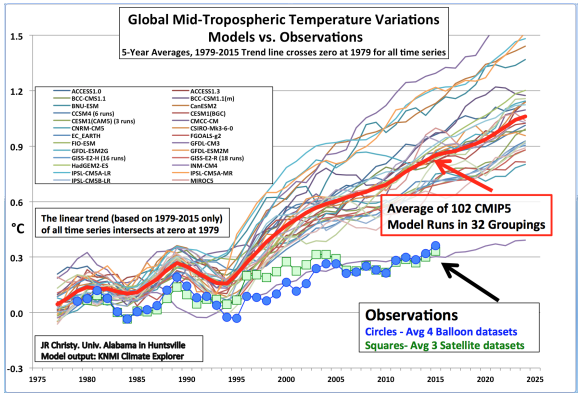 Meanwhile, a good chart comparing various computer models' projections of "more global warming" vs. actual warming starting 1975. A paleo-climate data over the past 1,100 years. 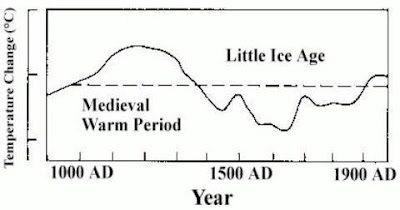 Even the first UN IPCC report in 1990 recognized this. 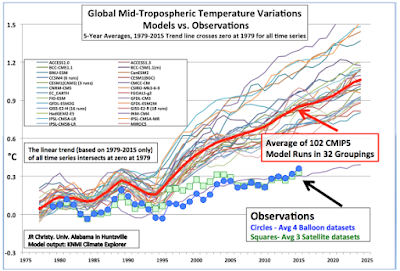 That chart was removed by succeeding IPCC reports. The UN and various country governments will never accept the theory of cyclical/natural/nature-made CC. It will invalidate their grand plans for global ecological central planning, the various climate rackets and junkets lined up in the coming decades or even century. I do not expect we shall have to wait that long. The ligitory nonsense seems ready to be perpetrated at this time. It complements nicely the fact that real penalties for war crimes do not happen except to the losers.